One-on-one physical therapy programs designed for you. We provide treatment for injury recovery as well as prevention. In addition to physical therapy, we offer alternative non-surgical options. Dr. David Chu is Board Certified in Physical Medicine and Rehabilitation. He is certified to provide acupuncture as an alternative pain treatment. He is also certified to perform electrodiagnostic testing. Dr. Chu completed a Physical Medicine and Rehabilitation residency at SUNY Downstate Medical Center in Brooklyn, NY, where he also served as Chief Resident. Dr. Chu received his medical degree from Jefferson Medical College in Philadelphia, PA, and he is a graduate of Penn State University's prestigious 6 year accelerated medical program. Dr. Chu is a member of a number of professional associations, including the American Academy of Physical Medicine and Rehabilitation and the New York Society of Physical Medicine and Rehabilitation. Dr. Vivek Mehta is a Board Certified physician in Physical Medicine and Rehabilitation. He is Fellowship-Trained in Interventional Spine Medicine at The Orthopedic Clinic Association located in Phoenix, AZ. Dr. Mehta completed residency in Physical Medicine and Rehabilitation at SUNY Downstate Medical Center in Brooklyn, NY. He has provided team coverage from high school to the professional level for various sports including football, basketball, hockey and baseball. He had the opportunity of being a Spine Consultant for the NBA Phoenix Suns, WNBA Phoenix Mercury and Arizona State University Football team. Dr. Mehta is a member of professional associations including North American Spine Society and American Medical Society of Sports Medicine. Carolita is an experienced, hands-on physical therapist providing compassionate care to her patients in a friendly, warm atmosphere. She employs therapeutic pain reduction and movement disorder exercises to ease pain and improve functionality in the shortest amount of time possible. Carolita treats patients with acute injuries as well as chronic pain. She is well versed in the treatment of neck, back, shoulder, and knee pain and injuries. Carolita expands her clinical knowledge through continuing education courses and staying current with evidence based practices and techniques, including the Graston techniques and the McKenzie Method of Mechanical Diagnosis and Therapy. Carolita has over 10 years of experience as a physical therapist and uses her extensive knowledge in orthopedics and the treatment of musculoskeletal injuries to work with patients of all ages and backgrounds. Carolita has a commitment to ensuring her patients can return to their active lifestyles. She focuses on exercise progression and works with her patients to develop customized home exercises to maximize progress. Her expertise has benefitted thousands of patients and her dedication to providing one-on-one patient care sets her apart from other physical therapists. Maria is an experienced physical therapist who strongly believes in hands on, one-on-one physical therapy. During your first visit, Maria will develop an individualized treatment plan with the goal of getting you back to what you love doing most, fast. Maria uses her extensive clinical experience in treating a wide range of musculoskeletal problems such as sports injuries, neck and low back pain, pre and post surgical rehabilitation, as well as issues associated with sciatica, sacroiliac joint pain, arthritis, degenerative disc disease, muscle spasms and intermittent numbness in hands or feet. Maria utilizes a multi-modal approach to treatment, including the Graston technique, trigger point release, joint and soft tissue mobilization, strain and counterstrain techniques, as well as muscle energy techniques. Maria is certified in The McKenzie Method of Mechanical Diagnosis and Therapy. She also incorporates modalities such as therapeutic ultrasound, electric stimulation, Positional Release Techniques for the spine and pelvis, and Comprehensive Manual Therapy Techniques for the hips, knees, and feet. Maria will constantly re-assess her patients during the course of treatment and will always make adjustments to expedite recovery and limit the number of visits. 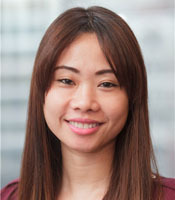 Rainegale Pesidas is a caring and mindful Doctor of Physical Therapy serving the community of NYC. Raine’s areas of expertise include occupational injuries and the treatment and prevention of injuries related to sports and exercise. Raine focuses her comprehensive clinical expertise on the development and implementation of individualized treatment plans for each of her patients in order to provide physical therapy that relieves pain and promotes healing as quickly as possible. Raine is experienced in the treatment of both acute and chronic conditions affecting the neck, back, shoulders, and knees. Her goal is to expedite the total healing process in the fewest number of visits. Raine strives to make the process of receiving physical therapy a personal and enjoyable experience and her passion for patient care helps to ensure a full and timely recovery. Raine understands the fears and sensitivities her patients face, and she works hard to help her patients overcome their health challenges. Patients rely on her expertise because she consistently provides high quality care that leads to positive and lasting health outcomes. Pain Conditions & Sports Injuries. We Treat It All. Our staff has been providing physical therapy in New York to a countless number of patients. At Manhattan Rehabilitation Services, we can provide a more conservative approach to treating your pain for the shoulder, lower back and spine.